REVENUES VS CORRUPTION: The Aquino administration is faced with the daunting task of raising revenues without imposing new taxes. It is faced with a widening budget gap that is projected to hit P325 billion this year or 3.9% of gross domestic product (GDP)...Corruption in the government's two main revenue agencies the Bureau of Internal Revenue (BIR) and the Bureau of Customs (BOC) are so entrenched that no less than BIR Commissioner Kim Henares agreed that it would take a lifetime to eradicate corruption in government. Nevertheless, she said that as head of the tax bureau, she does not and will not tolerate it in the agency...the fiscal situation remains fragile and that the government needs all the revenues it can get to be able to fulfill its obligation to its citizens, which is to provide adequate social services. However, this will not be possible if corruption remains rampant within the BIR and the BOC, the government's main revenue offices. CUSTOMS OFFICER FLUNKS LIFESTYLE CHECK: The Office of the Ombudsman has ordered the suspension of a Customs intelligence officer who is acused of amassing wealth beyond his earning capacity. Mitchell Verdeflor, assistant chief for operations of the Customs Intelligence and Investigation Service, has acquired P10 million in assets including luxury cars and prime pieces of property when his annual income amounts to only P156, 792 or P2.9 million for the 19 years he has served the bureau, the Ombudsman said. CUSTOMS TOLD TO ADDRESS DELAYS: THE Office of the Ombudsman has given the Bureau of Customs (BOC) five days to respond on complaints that some of its officials held various "balikbayan boxes" for unknown reasons. Assistant Ombudsman Evelyn Balitan alerted BOC chief Angelito Alvarez to anonymous complaints that some customs officials asked for unnecessary documents before releasing the boxes. 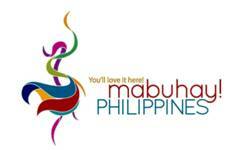 Filipinos living abroad traditionally send "balikbayan boxes" containing variety of goods during Christmas. TRUTH BODY CONTINUES TO RECEIVE COMPLAINTS: Despite a Supreme Court ruling declaring the Philippine Truth Commission unconstitutional, the five-member body continues to get information on cases of graft and corruption during the previous administration, according to Commissioner Carlos Medina. MALACAÑANG STRUGGLES TO SAVE TRUTH BODY: THE Aquino administration is "strongly" considering issuance of a new executive order in seeking reversal of the December 7 decision of the Supreme Court (SC) that declared unconstitutional the creation of the Truth Commission. President Benigno Aquino 3rd on Monday said that he was still studying all options available to his administration in contesting the High Tribunal's decision on Executive Order (EO) 1. "There are other avenues open to us in finding out the truth," President Aquino added. CONDUCT CODE FOR PROSECUTORS LAUNCHED: To promote high standards of conduct in the prosecution service, the Department of Justice recently released prescribed guidelines on the conduct of prosecutors. "Fairness, dignity, impartiality, integrity and professionalism, are all what should foremost epitomize all those serving under the National Prosecution Service," Justice Secretary Leila de Lima said. OMBUDSMAN WANTS CHARGES AGAINST SACKED CITY TREASURER DROPPED: The Office of the Ombudsman is seeking the anti-graft court's permission to withdraw 2 criminal charges against former Parañaque City treasurer Liberato Carabeo, claiming the indictments have no basis. BILL IMPOSES HEAVIER PENALTIES ON "FIXERS": An administration solon has batted for the imposition of stiffer penalties against fixers for government services which she blamed for the high incidence of corrupt practices in government. SANDIGAN BANS TESTIMONY: The Sandiganbayan barred Thursday businessman Mariano Tanenglian, estranged brother of businessman Lucio Tan, from testifying for the government despite being granted immunity from charges by the Presidential Commission on Good Government. SANDIGAN JUNKS 23 YEAR OLD "MARCOS" CASE: The Sandiganbayan Fifth Division cleared two former top officials of the Development Bank of the Philippines of any liability in a P51 billion civil lawsuit filed by the Presidential Commission on Good Government 23 years ago. ANTI-GRAFT LAW PROPOSED: ANY corporation, firm or individual banned by international funding agencies like the World Bank for corrupt practices must be prohibited from participating in any public bidding or construction contract with the government. Sen.Manuel Villar Jr., author of Senate Bill 2570, said the government must be vigilant in defending the integrity and reliability of public transactions, and "should hold wrongdoers accountable under the law." ANTI-CORRUPTION CAMPAIGN SAVES MASSIVELY: The campaign against corruption at the Department of Public Works and Highways (DPWH) has led to massive savings for government projects, Public Works Secretary Rogelio Singson said. Assessing the outgoing year, Singson said open competitive bidding was one of the major changes that helped improve the DPWH's image for 2010. He said that the policy of reform and good governance is slowly being ingrained among stakeholders, including the contractors themselves. P-NOY: BIGGEST CHALLENGE >>> JUDICIAL OBSTACLES <<< President Aquino says his biggest challenge in the New Year is overcoming judicial obstacles in his campaign against corruption. CSC: LGU TREASURERS COVERED BY NEPOTISM BAN: Appointments of treasurers in local government units (LGU) are covered by the ban on nepotism under the Local Government Code, the Civil Service Commission (CSC) said in a resolution. TAIWAN CRACKS DOWN ON PHILIPPINE-BASED INTERNATIONAL TELECOMMUNICATIONS FRAUD RING: The Criminal Investigation Bureau (CIB), working with authorities from the Philippines, cracked down on an international telecommunications fraud ring led by a Taiwanese man with networks spanning three countries -- Taiwan, the Philippines and mainland China. BILL SEEKS TO FINE "FIXERS" P1M: A lawmaker is seeking tougher penalty of up to P1 million against fixers in government transactions. Filing House Bill No. 3905, Bagong Henerasyon party-list Representative Bernadette Herrera-Dy said the measure aims to boost the Aquino administration's drive to rid the bureaucracy of graft and corruption. SOLON TO BE CHARGED WITH LPG FRAUD: The Supreme Court has approved the filing of criminal cases against Liquefied Petroleum Gas Marketers' Association (LPGMA) party-list Rep. Arnel Ty for the violation of two Marcos-era edicts on petroleum trading. TRUTH COMMISSION BUDGET CAN BE REALIGNED: President Benigno Aquino III may have P83 million more at his disposal if the Truth Commission is finally declared unconstitutional by the Supreme Court. And if this happens, Speaker Feliciano Belmonte Jr. said the budget of the truth body will form part of the savings. However, he wants it realigned to agencies that can do the same work...Congress kept intact its P83 million budget despite the ruling of the high court. Belmonte said the budget can be realigned to beef up the appropriations of the Department of Justice. If Malacanang wants to, the money can also be used by the Presidential Commission on Good Government, to pursue graft cases, although Belmonte expressed reservations on giving the PCGG the budget. 19 "OVERPRICED" WORKS SCRAPPED: The government has cancelled 19 "overpriced" airport civil works contracts with Japanese firm Takenaka Corp., as part of a review that started last July of deals awarded by the Arroyo administration in its "few remaining months." In a briefing with reporters yesterday, Transportation and Communications Secretary Jose P. De Jesus said the P2.3-billion total price for the rehabilitation and upgrade of the Ninoy Aquino International Airport Terminal 3 (NAIA-3) was "exorbitant." Takenaka was the subcontractor hired to build NAIA-3. "The P2.3-billion 19 stand-alone contracts...with Takenaka...have been cancelled, as we believe that these could be agreed on at a lower price," Mr. De Jesus said, noting these involved "minor works such as repairs [of] roof, walls." He explained that specific works on the airport terminal were awarded through "specific contracts." He added that the Department of Transportation and Communications (DoTC) estimates that cancellation of the NAIA-3 "midnight contracts" will result in "savings of close to $20 million." Mr. De Jesus said this was a result of his departments review of 168 contracts since July. LAWMAKER SEEKS TO REVISIT BIDDING PROCESS: Fourth District Board Member Ricardo "Ric" Yabut wants to revisit the procedures and guidelines being followed by the Provincial Bids and Awards Committee (PBAC), after discovering that more than P52 million in infrastructure projects of the previous administration were implemented by only a "few" contractors. Yabut said he wants to know if the bidding process is not tainted with irregularities, considering that the total budget allocation for infra projects was almost equally distributed to at least five contractors. DRIVER LICENSE BIDDING OPENED: The Department of Transportation and Communications has gotten rid of the preference for paper-based cards in the planned bidding for the P500-million supply of driver's license to the Land Transportation Office. Secretary Jose "Ping" De Jesus said the special bids and awards committee he had created has eased the terms of bidding in a move to give all prospective suppliers a chance to compete for the contract. With the new terms, all prospective suppliers, even if they are offering paper-based cards, or plastic cards, or cards made from other material, may participate in the bidding, he said. GROUPS HAIL CANCELLATION OF DREDGING CONTRACT: Leaders of the left-leaning fisherfolk alliance Pambansang Lakas ng Kilusang Mamamalakaya ng Pilipinas (Pamalakaya) and the umbrella group Save Laguna Lake Movement (SLLM) claimed victory over the cancelation of the controversial P 18.7 B Laguna Lake dredging contract. CUSTOMS OFFICER'S HIDDEN WEALTH REVEALED: The Department of Finance's anti-graft unit has filed with the Office of the Ombudsman an administrative complaint against customs operations officer Manuelo Algerre for allegedly lying about his net worth for the past 25 years. The DOF Revenue Integrity Protection Service (DOF-RIPS) wants Algerre to be charged with perjury and falsification of public documents for excluding questionable properties from his statement of assets, liabilities and net worth, or SALN. DOF-RIPS said in a statement the official "made misleading declarations, to the extent of not disclosing a number of unexplained acquisitions of real property and other landholdings in his sworn" SALNs from 1986 to 2010. SUPREME COURT REVIVES 18 YEAR OLD CASE: The Supreme Court has ordered the Office of the Ombudsman to proceed with a graft complaint filed against 12 former officials of the then state-owned Philippine National Bank who were allegedly involved in the grant of P205 million worth of behest loans to a private corporation...accused of conspiracy to defraud the government in giving a loan to CCPI in 1969 without sufficient collateral and only upon the urging of former President Ferdinand Marcos. The high court said former Ombudsman Aniano Desierto gravely abused his discretion by dismissing the complaint when he should have proceeded with the preliminary investigation. TRUTH COMMISSION OPTIONS: appealing the SC ruling through a motion for reconsideration, amending EO 1 to include transferring the Truth Commission's job to the Presidential Commission on Good Government, or delegating the task to the DOJ. OMBUDSMAN WARNS ABOUT GIFT-SEEKING: THE Office of the Ombudsman has issued a warning to government officials who ask or accept gifts during the Christmas season, especially from suppliers, contractors and clients. Ombudsman Merceditas Gutierrez said that Presidential Decree (PD) 46 is clear on the prohibition, and that private individuals or entities should also not give gifts to public officials and servants during any occasion, including Christmas. "The law is clear that gifts should not be allowed during Christmas season to government employees with more reason that if it was given in relation to ones office or performance of duties," Gutierrez said. However, she clarified that it would be hypocritical for government personnel not to accept gifts during the Christmas holidays, since gift giving is part of the Yuletide season. Gutierrez added that any form of gift giving should be limited to "moderate gifts only." "As a Christian nation, gifts are given as a sign of sharing but government officials must always bear in mind that moderate gifts could be allowed," she said. The Ombudsman chief stressed that cars, house and lot packages and expensive clothes are not moderate gifts and would be considered as a bribe if given to public officials. CSC: KEEP CHRISTMAS PATRIES SIMPLE >>> Government agencies received a last-minute reminder to keep their Christmas parties simple, and to resist the temptation to receive expensive gifts. Over the weekend, Civil Service Commission chairman Francisco Duque III said those who receive or even ask for gifts face charges under the Anti-Graft Act. JUSTICE SECRETARY, 5 BIR EXECS CHARGED WITH PLUNDER: A private citizen claiming to be an anti-graft advocate filed with the Office of the Ombudsman on Friday a plunder complaint against Justice Secretary Leila de Lima, Bureau of Internal Revenue (BIR) head Kim Jacinto-Henares, and four other BIR officials. The complainant, Danilo Lihaylihay, said De Lima and the BIR officials "maliciously" connived with one another when the Justice secretary revoked an earlier ruling that grants a BIR informer a 25-percent reward for information about tax evasion cases. Lihaylihay is the same complainant in the tax evasion complaint against former President Gloria Macapagal-Arroyo on the sale of the old Iloilo airport in 2007. Lihaylihay is claiming that he deserves a P1.13-billion reward for supposedly providing the BIR with information about tax evaders. IRREGULAR ROOFING MATERIALS PURCHASE CITED: Ombudsman Merceditas Gutierez has approved the filing of criminal and administrative charges against former Aloguinsan Mayor Cynthia Moreno and seven others, in connection with the allegedly irregular procurement of materials for the new municipal building's roof in 2007. "SLIM" CHANCES FOR TRUTH BODY: A member of the embattled Philippine Truth Commission on Saturday admitted that the chances of the Supreme Court changing its ruling against the body were "slim." Commissioner Carlos Medina said members of the panel were instead banking on the justices' individual conscience to see through the merits of the motion for reconsideration that Malacañang is preparing to file before the end of the year. CCP CONDO PROJECT PROBE URGED: A lawyer has called on President Benigno Aquino III to prove true his vow to end corruption by looking into shady deals entered into by the past administration. J. Antonio Z. Carpio Jr., of the Carpio Law Office, particularly urged the President to investigate the P3.5 billion joint venture agreement entered into by the Government Service Insurance System and Megaworld Corporation on May 25. The project involves the construction of a mixed-used condominium on the GSIS-owned property at the Cultural Center of the Philippines Complex in Pasay City. In a statement, Carpio noted that any major contract sealed a month before the inauguration of the new administration qualifies as a midnight deal and should be revoked or put on hold and reviewed. COA STARTS AUDIT OF AUTONOMOUS REGION: The Commission on Audit has started a widespread audit of the Autonomous Region in Muslim Mindanao to find out how government funds are being spent. President Benigno Aquino III said the audit is important to determine why the ARMM remains one of the poorest regions in the country despite receiving billions of pesos in allocations. Local officials found guilty of stealing government funds will be sanctioned, he added. Aquino said the ARMM audit is part of his plan to wipe out graft and corruption in government. ANTI-CRIME CRUSADER RESIGNS IN DISGUST WITH JUSTICE SYSTEM: Dante Jimenez has resigned from his post as chairman of the Volunteers Against Crime and Corruption...saying he had "lost all faith in the criminal justice system of the Philippines" after the acquittal of Hubert Webb et al of the Vizconde massacre. He said that he would continue finding ways to help the marginalized find justice "outside of current justice system", which he branded as "corrupt", "very slow" and "very expensive." LOW TOP-LEVEL PARTICIPATION IN BOHOL ANTI-CORRUPTION WORKSHOP: An activity that was supposedly to be participated by provincial officials, aside from the employees and heads of offices, unfortunately end up with only senior board member Dionisio Balite from among the board members invited and provincial administrator Alfonso Damalerio II, attending the seminar. MULTI-SECTORAL GROUP SEEKS ZAMCELCO MATTER ACCOUNTABILITY: A letter is calling for the immediate intervention of Aquino in the corruption controversies hounding Zamcelco, pointing out the present administrations aim of zero tolerance for corruption. The letter states "the latest National Electrification Adminitsration (NEA) audit highlights significant financial and operational findings, many of them similar to past audits, alleging corruption, malpractices, collusion, etc." It added that "the cycle of NEA audit findings, Zamcelco response and eventual exoneration by NEA, as has happened numerous times in the past, may happen again. This has far reaching impact in the fight against institutional corruption as NEA is supposed to safeguard the consumers' welfare and not be part of a corrupt system" The group is calling on Aquino to ensure an honest and open investigation on the matter and to hold accountable the offending parties. PLEA BARGAIN FOR EX-GENERAL? : In an indication that a plea bargain is in the offing, a former military comptroller accused of amassing more than P300 million in ill-gotten assets Thursday pleaded guilty to two lesser offenses at the Sandiganbayan anti-graft court Thursday. EX-AIRPORT MANAGER FINED: The Ombudsman-Visayas fined Adelberto Yap equivalent to six months's worth of salary for falsifying public documents certifying his appointment as airport manager by authority from the Office of the President. FINANCE EXEC "FLOATING": The Department of Finance (DOF) on Tuesday clarified that DoF official accused of attempting to bribe a Customs official into releasing smuggled goods is not an officer of DoF's Revenue Integrity Protection Service (RIPS). Finance Assistant Secretary Peter L. Calimag stressed, Ruben Frogoso, "is not in any way connected with RIPS and is currently on a floating status with the DOF contrary to news reports" and is facing several cases before the Ombudsman, the Civil Service Commission, and the Court of Appeals. PASAY TAX DIVISIONS PROBED: The Pasay City Treasurer's Office asked police to investigate alleged irregularities at the Land Tax Division, License and Business Tax Division and at the city Public Market and Pasay Mall. According to the Pasay City police chief, Senior Supt. Napoleon Cuaton, city treasurer Manuel Leycano sent him a letter seeking an investigation of reports that taxes due to the city government were missing because of massive fraud, pilferage and manipulation. NBI: MORE CRIMINAL RAPS FILED: The National Bureau of Investigation (NBI) on Thursday filed before the Department of Justice (DoJ) another batch of criminal cases against the president of Globe Asiatique Realty Holdings Corp. (Globe Asiatique) and several others in connection with alleged irregularities in a housing project in Pampanga. WHISTLEBLOWER: "NO ACTION ON CUSTOMS GRAFT": Malacañang has taken no action other than refer to the finance department reports of massive corruption in the customs bureau here detailed by a whistle-blower who said smuggling is bleeding this city's main port dry of tens of millions of pesos. Rodolfo Reta, businessman who broke the lid on alleged massive corruption at the customs bureau here, said he had sent a letter to Mr. Aquino detailing what he said were "mafia-like operations" of smuggling syndicates and corrupt customs officials here. CUSTOMS EXEC QUESTIONS WHISTLEBLOWER'S MOTIVES: The highest ranking customs official here turned the tables on a businessman who had claimed to have uncovered massive corruption in this city's port under the official's watch. "I hope the media and so-called antigraft groups will see the big picture in the issue of alleged high-profile smuggling case in Davao," said Anju Nereo Castigador, Davao City district customs collector, in a press statement. "We must remember that the man they now call a whistle-blower is also a businessman who lost a multimillion contract," said Castigador. Castigador said Rodolfo Reta, owner of Aquarius Container Yard (ACY), apparently had an ax to grind against the customs bureau. He said Reta used to be a contractor but on March 5, then Customs Commissioner Napoleon Morales rescinded the contract with the businessman after ACY security guards barred customs examiners from entering its compound. Castigador said customs examiners were to inspect 40 container vans following a smuggling alert from a customs official, X-Ray Inspection Division Head Ma. Lourdes Mangaoang. The vans turned out to contain smuggled rice. "INTEGRITY INITIATIVE" NEW ANTI-GRAFT APPROACH: "CERTIFICATION OF FIRMS" >>> The business community has launched an anti-corruption campaign that it hopes would stop government from dealing with crooks. 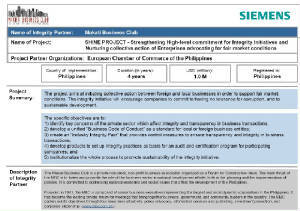 The campaign, Integrity Initiative, will come out with a certification system for "clean" companies, which would have first crack at government projects, said Makati Business Club chairman Ramon del Rosario Jr. Chief executives of 300 large to small companies, both foreign and local owned, have signed up to the Integrity Initiative. A $1-million funding came from the firm Siemens AG, which in the past came under fire after a subsidiary was linked to corrupt practices. Del Rosario said the campaign will start with certifying companies as compliant with ethical business practices. Later, government will be asked to limit its dealings to integrity-certified companies. NEW BOOK >>> SEVEN DEADLY DEALS: The nine-year presidential reign of Gloria Macapagal-Arroyo is a depressing litany of major infrastructure and other projects and agencies that ran into trouble because of political interference, corruption and or bad planning, and missed opportunities to move in the right direction. None of the scandals are new to the Philippines energetic press. But they are outlined in considerable detail in a new 130-page investigation called Seven Deadly Deals from Newsbreak, a Manila-based team of reporters and editors, and made public earlier this week. The eight journalists involved in the project devote a full chapter to each of the seven episodes...to be available in Philippine bookstores at the end of December, and through the electronic book sales portal http://www.fullybookedonline.com of the Manila bookstore Fully Booked at a cost of Php300 (US$6.85). COMMON PERKS: While the Sandiganbayan deliberates on a plea bargain proposed by accused plunderer Maj. Gen. Carlos Garcia, it is useful to go over the statements of his wife that led to their family's downfall. The statements given to US authorities by Clarita Garcia were meant to save her sons Juan Paulo and Ian Carl from trouble with the law...Clarita's explanation of the source of the money provides a revealing glimpse into the ways by which immense wealth can be accumulated illegally in the military...The statements, given in June 2004, detailed how Carlos Garcia and his wife received "expense money gratitude money shopping money" from businesses in Europe and Asia that had won contracts to provide military hardware to the Armed Forces of the Philippines as well as Philippine contractors who won deals for military housing, roads and bridges. FROM PLUNDER TO BRIBER: The AFP general staff and rank and file, through the chief of staff, are all loud and clear in shouting NO to the prosecutor's unexpected gesture of true kindness by readily consenting to a "deal," giving the culprit the benefit of the doubt...If the US authorities had not intercepted an undeclared baon of $100,000 by one member of the suspect's family, the public wouldn't have known that an AFP general was involved in the reported diversion of P303 M budget for supplies and various contracts to improve the military organization's capability. Hurry, bargain sale ongoing at Sandigan! TEST OF PRESIDENTIAL LEADERSHIP: Reversing the Sandiganbayan's pending decision to let retired Brig. Gen. Carlos Garcia off lightly would be a major test of President Benigno Aquino III's leadership. And by leadership in this case is not meant simply giving orders or blaming the Office of the Ombudsman, but finding ways and means to use the enormous powers of the presidency to ensure that justice is done...If Mr. Aquino thinks Ombudsman Merceditas Gutierrez is stonewalling the cases against Arroyo, he should put this project in a separate box in his mind, and cooperate with her in prosecuting other cases, and there are a lot of them. A president can't act like a spoiled brat who sulks and then snubs somebody who didn't follow his wishes, while his officials keep on making impeachment threats. The President can find ways and means to ensure that justice is done. PLUNDER BLUNDER THUNDER: The legal loophole was so big that even a military officer accused of wide-scale corruption could walk through it. And thats exactly what retired Major General Carlos Garcia, detained for six years for stealing P300 million as military comptroller, did... The fact of the matter is, no general would end up as rich as Garcia has upon retirement, had he just relied on his salary for his income. He would not have a Manhattan residence for his kids, who would not be jetting around the world carrying obscene bundles of hundred-dollar bills that they would somehow fail to declare after leaving Manila en route to wherever it is they intend to stash these funds. And no anti-graft prosecutor, regardless of how well-meaning he or she is, would fail to appreciate the gravity of the Garcia family's offense or the firestorm of protest that a plea bargain with them would cause. Regardless of how perfectly legal such a deal is, it will still have to pass muster in the court of public opinion...The Garcia case may be far from closed, but future attempts to pull a supposedly legal fast one on all of us will not end until the loopholes are plugged. PLEA BARGAIN: People who worked to prosecute retired Maj. Gen. Carlos Garcia for plunder are preparing to challenge the plea bargain he has struck in exchange for a lighter sentence. Opponents of the deal have pointed out that plea bargaining is allowed only before the start of trial. Once an accused has entered his plea, he will have to stick to it and defend it in court until the decision is handed down, the opponents argue. INTEGRITY INICIATIVE: THE business community's campaign to come up with a "certification" system for companies compliant with ethical standards is a good start in trying to curb corruption in business dealings, especially with government. But there is a long way to go before the campaign's long-term goal to give "clean" companies first crack at government contracts is reached. The campaign, Integrity Initiative, is spearheaded by the Makati Business Club and the European Chamber of Commerce of the Philippines. To start the ball rolling, Siemens AG has provided funding amounting to $1 million. "FIXING": It is of common knowledge that "fixers" abound in government service including the Judiciary. This is a fact of life that people have grudgingly accepted and learned to live with. Apparently, "fixing" is hard to prevent because there is really a very thin line separating the act of fixing with the legitimate act of extending assistance to people in need which is but part of public service. In this case of Cario however, the Supreme Court is able to discern and draw this thin line by a closer scrutiny of the facts and circumstances. (Click here to read about the case). ANOTHER CASE FOR INVESTIGATION: A group allegedly manipulated the stock pricing of publicly listed Philex Mining Corp. for a huge windfall but in breach of banking laws. Sources in the Philippine Stock Exchange aver that Philex share prices suddenly spiked four-fold in a matter of weeks last year. This was after the state-owned Development Bank of the Philippines loaned P800 million to an obscure firm to buy and sell Philex stocks. The loan was given sometime mid-2009 to the firm that had no track record or collateral, but well connected.